I qualified as a Personal Trainer in March 2006. I basically took my passion and made it into my career. At the age of 39 it was a big decision to start studying again. On completion of my course with The Australian Institute of Fitness, WELL-LIFE was born. In June 2006 I qualified as a Pilates Method @ Instructor with ‘Physicalmind Institute. 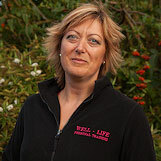 From there I studied at Bridgwater College part-time and gained a Diploma in Holistic Massage in 2008. I have continued to study part-time to gain new techniques, ideas and to expand on the services I provide, to prove my ongoing commitment to my clients. In 2008 I qualified as a specialist in the Management of Lower Back Pain. It has proved to be a very valuable course. It has given me a great understanding of many back conditions and how to treat them successfully. I am blessed with having the intuition along with the knowledge to really make a difference. It took time to build up a client base, but my strength of character, self motivation, passion and a genuine care for people, drove the business forward. These qualities along with my life experience and compassionate nature has built a good reputation and a healthy client base.